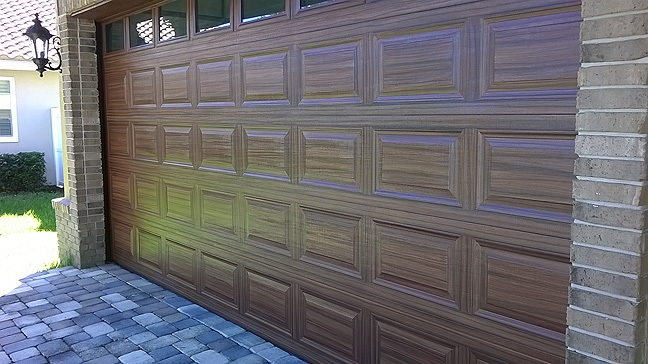 I was able to complete painting the single car garage door to look like wood today. I have some photos to share but first I'd like to address the particular style of the door. In my post yesterday I made reference to profile of the center panels. 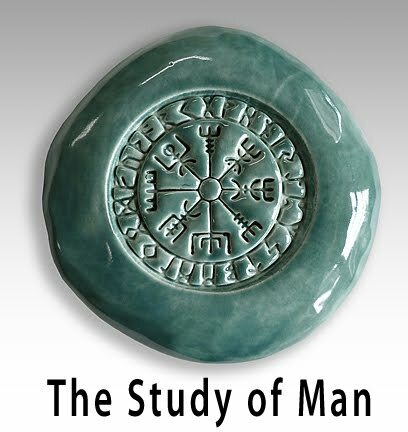 Take a look at the first two photographs. Typically the area I have outlined in white I paint with a vertical paint stroke. But with this style that area were the white arrow is really not beveled much at all. It is almost flat. So what I did with these doors is just paint the area indicated by the green arrows with a vertical paint stroke. And then as indicated with the red arrow I made the horizontal grain go all the way across. You can see better what I am talking about in the next photo. The horizontal grain goes all the way across the center panel and the only vertical grain goes in between the panels. Once I have all the panels finished on the top two rows I tape off the area between the rows of panels so I can paint it in with a horizontal paint stroke. When I do this I have to tape over what I have already painted but as soon as the paint dries with the low tack tape it is ok. Also if you will note the white arrow in the photo below, that is showing that I tape off the end of the horizontal space. That way I can run the wood grain on the ends of the door from top to bottom. So in the next photo you can see how after I have taken the tape off I have left on the sides of the door that space to be painted in from top to bottom in a continuous vertical wood grain pattern. 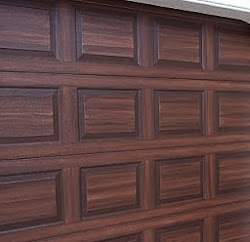 Here is a photo of the finished single car garage door painted to look like wood. Tomorrow I will start on the double car door. what kind of paint (and color) did you use? Nicole, I use Sherwin Williams exterior paint. The base coat color for the door is SW Toasty. Then the first color brown is SW Fiery Brown and the second and darker color is SW Turkish Coffee. Hope this helps.